EMA is proud to offer ENERGY STAR® Awards, and BERDO / BEDUO e-Filings of energy / water reporting services to help businesses reduce energy costs, retain Tenants, protect the environment & comply with Municipal ordinances. Avoid costly BERDO mandated ASHRAE level 2 energy audits by achieving a minimum of 3 ENERGY STAR Awards in each 5-year BERDO cycle. Association of Energy Engineers: "Project of the Year". Excellence in Energy Engineering - Energy Optimization work performed at the Harvard School of Public Health in 2000. Excellence in Energy Engineering - Demand-Controlled Ventilation work performed at Hewlett Packard in 2005. Winner – Professional Development / Trainer Award 2018. 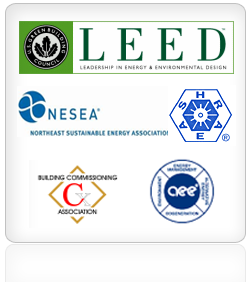 USGBC LEED Certifications where EMA provided Commissioning Services. Welcome to Energy Management Associates, Inc. (EMA). EMA is a consulting engineering firm specializing in Energy Engineering, ASHRAE Level 1-2-3 Energy Audits, and HVAC Controls Commissioning. EMA provides its customers with LEED™ Commissioning, Retro-Commissioning, Continuous Commissioning, Continuous Re-Commissioning, Real-Time Predictive Energy Models, investment grade energy audits, DOE2.2 supported energy simulations and traditional HVAC troubleshooting. As a member of the United States Green Building Council (USGBC), EMA encourages LEED™ Commissioning and Certification of sustainable energy-saving designs. Steve Di Giacomo, PE, CEM, CPMP is a Registered Professional Engineer holding licenses in MA, RI, NY, NJ, PA and ME in Mechanical Engineering. He is an AEE Certified Energy Manager, and ASHRAE certified commissioning process management professional. Mr Di Giacomo has logged over thirty years of specialized Energy Engineering HVAC auditing, analysis, design, commissioning and facility operations experience with industrial, research, hospital, chemical, pharmaceutical and commercial facilities at both the site and corporate levels. He co-teaches a popular NESEA 3-hour workshop "Lessons Learned from High Performance Buildings: What Went Wrong? Why did they not Perform? ", is NESEA moderator, and a panelist at AEE Technology Roundtable events.. Mr. Di Giacomo has authored a number of articles on CO2 based demand-controlled ventilation (DCV) in both Engineered Systems Magazine and the Journal of Energy Engineering. Mr Di Giacomo was designated by ENERGY STAR as "Most Active Licensed Professional", certifying over 100 buildings each year for ENERGY STAR Awards, as well as provides e-Filings for BERDO and BEUDO and other Municipal Ordinances.